Respirator protects wearer against harmful chemicals. Hood-style escape respirator ER1000 provides 30 min (minimum) of respiratory and face protection from nuclear, chemical, and toxic industrial materials as well as biological agents. Able to be donned and functioning within seconds, unit includes translucent hood and half-mask design that limits re-breathing of exhaled air. Anti-fog and scratch-resistant lens provides wide field of vision, while front-mounted exhalation valve enables users to speak normally. 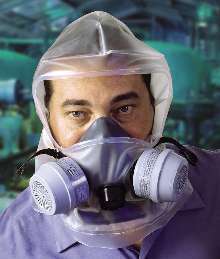 CRANSTON, R.I. (June 23, 2003) - North Safety Products has introduced a hood-style escape respirator designed to provide a minimum of 30 minutes of respiratory and face protection from nuclear, chemical and toxic industrial materials as well as biological agents. It was developed to protect employees during emergency evacuations from facilities that may be a target for a terrorist attack or that have potential for a chemical accident. Comfortable and easy to use, the new ER1000 escape-hood respirator can be donned and functioning within seconds. The escape-hood respirator is made of materials that are highly resistant to chemicals. It uses North's new Defender Plus(TM) cartridges with ASZM-TEDA carbon, as specified for U.S. military canisters. The ER1000, designed to meet the escape-hood standard proposed (April 15, 2003 draft) by the National Institute of Occupational Safety and Health (NIOSH), was tested at the U.S. Army Soldier Biological and Chemical Command (SBCCOM). Hood permeation and cartridge service life test results are available upon request. North's escape respirator features a translucent hood for easy face recognition and reduction of claustrophobia. Its proven half-mask design reduces fogging, and improves user comfort by limiting re-breathing of exhaled air. A large, anti-fog and scratch-resistant lens provides a wide field of vision and excellent visibility. One size will fit most adults and the user can speak normally through a front-mounted exhalation valve. "This is an important feature that makes the ER1000 easier to use than many escape-hood respirators," said John Vincent, respiratory product manager for North Safety Products. "With many others, the user must alternate between speaking in short phrases and breathing in air through a snorkel-like mouth bit." The ER1000 comes in a moisture- and light-resistant foil package that is re-sealable to allow the user to practice donning prior to emergency use. A three-language instruction sheet is included and easy 1-2-3 pictorial training instructions are on the package. No additional training devices are needed, although general disaster preparedness training is recommended. North Safety Products, one of the world's largest manufacturers of occupational health and safety products, offers a full range of quality personal protection equipment, including head, hearing, eye/face, respiratory, hand and fall protection, lockout/tagout, protective footwear and clothing, first aid, controlled environment, safety signage and traffic safety products.